An extraordinary little elephant returns to the big top in Dumbo, the latest in Disney’s series of live-action re-imaginings of classic favorites. 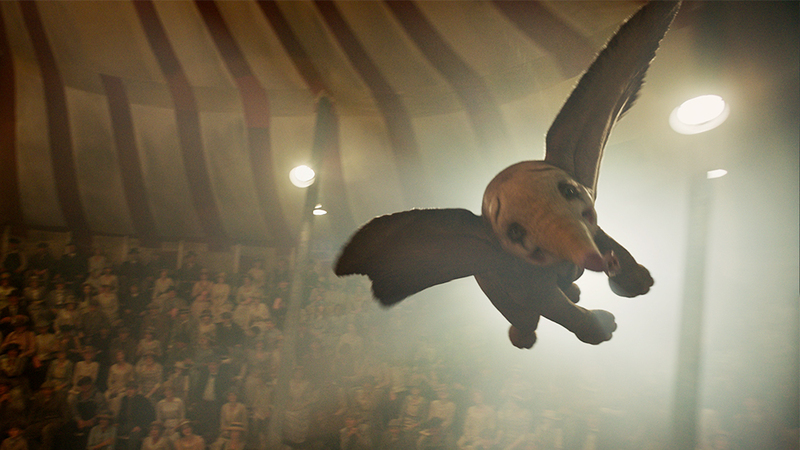 Directed by Tim Burton and starring the likes of Colin Farrell, Michael Keaton, Danny DeVito, and Eva Green, Dumbo brings stunning aesthetics to the big top – but struggles to maintain a compelling story throughout. We begin in 1919 at a down-and-out theater owned by Max Medici (DeVito), a ringmaster who has some standout moments – particularly those involving a monkey terrorizing his office. Farrell plays Holt, a horse trainer and trick rider turned disabled war veteran, who returns to the circus – and his two young, motherless children (Nico Parker and Finley Hobbins). Holt’s beloved horses have unfortunately been sold off, but he’s back just in time to take on a new job: elephant caretaker. Enter: baby Dumbo. I’ll say this – Dumbo is ADORABLE. As in the original, Dumbo doesn’t talk, so much of the focus is on his large, expressive, often watery (the tears!!) blue eyes. And of course, on his unnaturally large ears. The kids, Millie and Joe, soon help Dumbo learn to fly with the help of a feather. Seeing the baby elephant soar around the ring is exhilarating, particularly the first time it happens. Word of this wonder elephant spreads, reaching the rich and powerful V. A. Vandevere (Keaton) in New York – who brings the whole ragtag gang under his wing, taking the story to Dreamland. This sprawling amusement park contains attractions such as Nightmare Island, Wonders of Science, and Rocket to the Future. Then, there’s the Colosseum, where Dumbo will perform with Colette (Green) – Vandevere’s arm candy, though she proves to be much more than that. From the iconic circus train and rundown camps at the beginning to the sleek, corporate sprawl of Dreamland – and the costumes (THE COSTUMES!) – Dumbo truly soars in the aesthetic department. This is the Tim Burton goodness we’ve come to know and love, an art book waiting to happen, and all the Moulin Rouge and Greatest Showman vibes you could want. There are also many fun nods to the original animated classic, from a beautiful rendition of “Baby Mine” to clever takes on the stork and “Pink Elephants on Parade” scenes, and even a Casey Jr. sighting. Fans will delight in these fun Easter eggs, which range from stunning visual centerpieces to subtle surprises. Some of the characters pop delightfully – DeVito has some standout moments, Green is fantastic and surprising as Colette, and Nico Parker is fantastic as the determined and science-oriented Millie – but as mentioned previously, Dumbo struggles to maintain a compelling story throughout. The runtime is near two-hours and felt long to me. As much as I loved drinking in the visual details and Danny Elfman’s score, it wasn’t quite enough to hold my interest throughout. All in all, Dumbo was a mixed bag (of Cracker Jacks? Do we go with a circus metaphor?) for this writer. I definitely appreciated seeing Burton’s take on a Disney classic – especially one that truly allowed his creativity to run wild across such varied settings. Here’s hoping we will continue to see such stylistic variations across Disney’s upcoming slate of live-action retellings. Dumbo is in theaters now.